We aspire to build a community of teammates inspired to do great things. • Our application is approximately 11 questions and will take you roughly 15 minutes to complete. The fastest way to apply is to upload your resumé. ​​​​​​​• Complete the application in one sitting. Your information will not save if you leave the application and return to it (and we want to get to know you). ​​​​​​​- Watch out for a confirmation email. This signals that your application was received. - See who else you know that works at DaVita. If they can attest to your work, ask them to submit you as a Teammate Referral. ​​​​​​​- Follow us on our DaVita Careers Social Media Pages to stay up to date with hiring events, teammate spotlights and other DaVita highlights. • Some of our key roles require a pre-hire assessment. Here’s a 2 minute video below to prepare you if you’re asked to complete the pre-hire assessment. - Schedule Time. Our assessments range from 25-55 minutes depending on the role. The higher the level of position the longer the test. - Find a Quiet Place. Take the test in a quiet place without any distractions. - Take it Seriously. Even if you think you have the job in the bag, take this assessment seriously. It is required that you pass it to be hired for the role. - Be Honest. Don’t try to trick the test. It won’t go in your favor & just be you. • Some of our key roles have a realistic job preview video. Watch it to learn more about the job and DaVita. • Not only will this help you determine if that role is a good fit for you, it gives you insight into the day in the life of the role. ​​​​​​​Getting ready to interview – see our Interview Tips here. ​​​​​​​• Speaking of realistic, check out Google for Jobs to make sure the commute time is realistic for you for the job that interests you. You may have a phone interview with a recruiter. Recruiter sends the best to Hiring Manager for review. 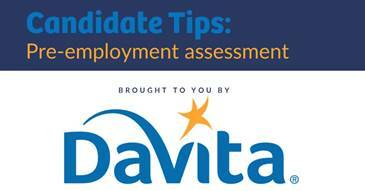 At DaVita, we might ask you behavior-based interview questions. What is behavior-based interviewing? ​​​​​​​Behavioral interview questions seek concrete examples of your skills and experience. Instead of asking “what would you do?” we ask “what have you done?” By asking you about your past behavior, hiring managers try to get a sense of how you might respond in similar circumstances in the future. When preparing for an interview think about skills and experiences you want to highlight. These can be examples from work, school, volunteer or personal life. Look at your resume and ask yourself: what are you proud of, what do you bring to the table, what you have done in your past that aligns with the role you are interested in?